For the most part I was able to follow the Exchange UM 2007 Deployment guide that was available with OCS and the Lync UM guide for the Lync bits. The problem as I recall with UM 2007 was that the naming convention of the UM Dial Plan had to match the location profile on OCS. Only thing is that Lync no longer has location profiles, these have been replaced with Lync Dial Plans. 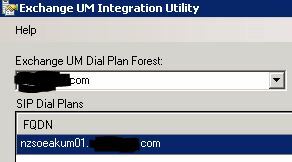 So wanting to check both of these proverbial boxes I created a Lync Dial Pan named the same as the UM Dial Plan. When Running the OCSUMUtil you can see the Lync Dial Plan naming and so correct it accordingly. 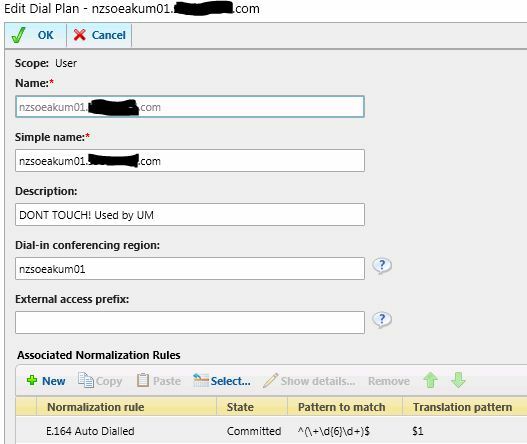 One final adjustment was to add a normalization rule to this Lync Dial Plan to allow for calling to the UM and voila.